Our plan was to leave Fort Knox and drive to Huntington West Virginia but the Behemoth had other ideas. Nearing Lexington, Kentucky a coolant light went on and the engine went into protection mode. Fred got us safely onto the shoulder of the road where we waited for roadside assistance. A mobile tech was unable to fix the problem so our home had to be towed to a local Cat dealer for repairs. Not a good feeling to see it traveling down the road not under its own speed. The repair shop was a busy place and was not able to get to us for several days. They did allow us to stay with the coach in their parking lot and even had the tow truck put us near a power outlet. The folks at Whayne Caterpiller were very good to us. The coolant leak turned out to be from a cracked hose that they had to access through the floor of the bedroom closet. Fixed 3 days earlier than the original estimate, we headed out toward West Virginia. We arrived in Huntington in the late afternoon and pulled into the Robert Nealon Air and RV Park just in time to see members of the skydiving club float down. This interesting RV park is a combination of small craft airport and RV park. It is home to the West Virginia Sky Diving Club. The owners were friendly and enthusiastic about their operation. There is a great restaurant on site...airport themed of course. 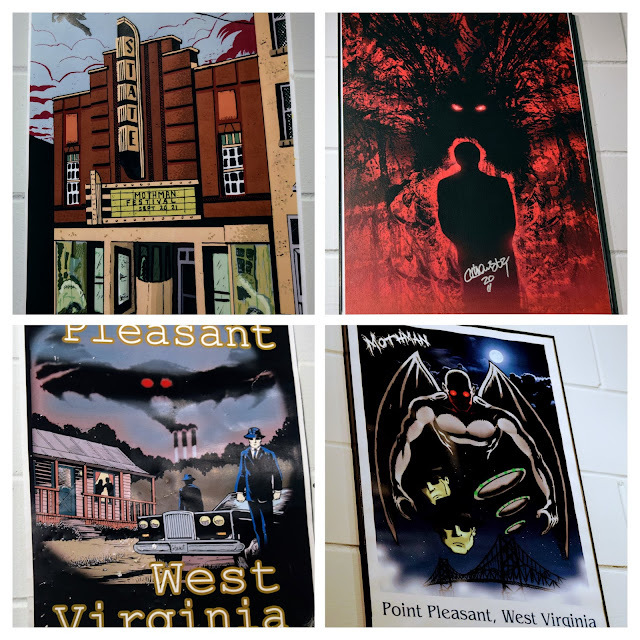 The purpose of our stop in Huntington was to visit Point Pleasant West Virginia, home to the Mothman legend. We have been intrigued by the Mothman legend since seeing the 2002 movie The Mothman Prophesies starring Richard Gere and Laura Linney. The book and movie are based on events that occurred in Point Pleasant in the weeks before the collapse of the Silver Bridge on December 15, 1966. The Silver bridge fell into the Ohio River during evening rush hour traffic and was responsible for the deaths of 46 people. Strange sightings of the Mothman as well as lights in the sky and visits from men in black were all reported to local police and written about in the Point Pleasant Register. The Mothman Museum has copies of the newspaper articles on display as well as copies of witness accounts of the sightings. There are many props from the movie on display as well as a collection of original art that is Mothman themed. We enjoyed spending an hour walking through the museums exhibits before walking down to the Riverfront park. Point Pleasant is protected from the Ohio River by a 20 foot flood wall that has been painted with murals that depict the history of the area. The flood wall mural includes George Washington and Daniel Boone. We made one stop on the drive back to Huntington. Hillbilly Hotdogs is a local favorite that has been featured on Guy Fieri's Diners Drive-ins and Dives. You cant help noticing it since cars line both sides of the road and a line stretches out the door waiting to order. It is a hot dog stand with counter service in a setting that looks like a hillbilly yard sale. There are 2 old school buses retrofitted with tables where you can sit to eat. The outdoor seating area includes fun little signs and yard ornaments to look at. Hillybilly Hotdogs is home to the Homewrecker, a one pound all beef hot dog in a roll topped with cole slaw and jalepeno peppers. If you can eat it in 9 minutes they will give you a tee shirt to celebrate that accomplishment. We didn't even consider it.